55” front, 72” back, 42” deep. Humes and Berg has been manufacturing risers for the performing arts for over 60 years. Our E-Z Fold Risers are made of the finest materials available. The under structure of our risers are made of a heavy wall aluminum square tubing. All the hinges are welded to the frame. Each riser has our patented Safety Brace that will lock to ensure stability at all times. 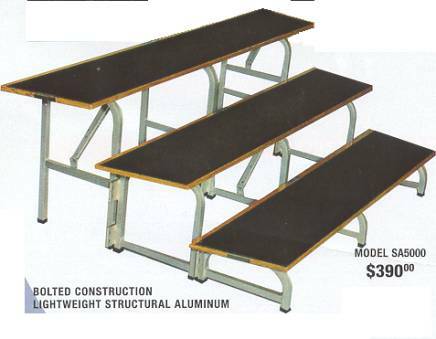 All seated choir and band risers have a steel frame under each section. The outside edge is also lined with a Galvanized angle to ensure the long lasting characteristics of our risers. Our risers are in use today in thousands of schools and institutions throughout the world. Bolted Construction of lightweight structural aluminum. E-Z fold 3-Step Sections. 4 sections will accommodate 80-85 singers. Accommodates 16 to 19 singers. Each section is 6’ long. Elevates 8”, 16”, and 24” high. Structural Aluminum Heavy Gauge Square Tubing. Structural Aluminum Heavy Gauge Hinges Welded Solid Throughout. E-Z Safety Locks Automatically Sets-Up and Locks Immediately. All Wood Steps Covered with Genuine Rubber Grooved Matting.